Basically a “dill crock” is a variation on fermented veggies. 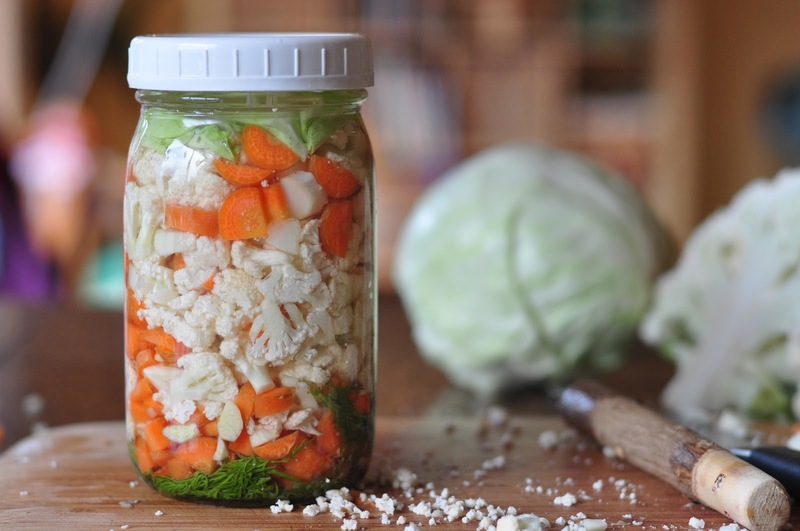 If you don’t have dill or a grape leaf you can still make the fermented veggies. The sea salt is a preserving agent that reduces putrefying bacteria from getting a foothold. This is an easy project, adapted from The Living Farm newsletter several years back – so be brave and give it a try..
Use a quart, half gallon jar or crock. Make a brine of 2 Tbsp salt, 6 cups water, and ½ cup cider vinegar. The brine is used to cover all the vegetables in the crock. Grape Leaf – Place a small layer of grape leaves in the bottom of the jar to help keep veggies crisp, if desired. This is not essential. Dill: Place a layer of dill on top of the grape leaves. Also optional – other herbs such as garlic or ginger can be used. The Vegetables: Almost any crisp vegetable can go into a “dill crock” such as carrots, onions, garlic, cauliflower, peppers, green tomatoes, cucumbers, celery, etc. Green Beans need 3 minutes of blanching because otherwise they turn out too tough or hard to chew. Time: Once you fill the jar or crock with the vegetables, pour in the brine, screw on a cap tightly to the jar or weigh the vegetables down with a plate and rock to hold the vegetables under the brine. Store the vegetables in a closet or cupboard for 5-6 days up to 2 weeks. If a white foam appears at the top do not panic, this is normal, just remove the foam and the vegetables are ready to eat. Let your nose be your guide. This is not an official USDA method, but a time-tested method used for centuries to preserve vegetables.